Copy of an SCP-2452 instance. Note the presence of SCP-2452-1. Special Containment Procedures: All instances of SCP-2452 are to be contained in Anomalous Gallery 27, located at Site-09, and kept behind reinforced glass at all times. All personnel entering and leaving Anomalous Gallery 27 are to be logged by on-site security. In the event that an instance of SCP-2452 is destroyed and SCP-2452-1 released, agents armed with suitable photographic equipment are to be dispatched to the homes of individuals portrayed in the destroyed instance. Upon engagement with SCP-2452-1, photographic equipment is to be used to re-contain SCP-2452-1 and any casualties explained to the public using Misinformation Campaign 24332-D ('The ███████ Strangler'). Any witnesses to an SCP-2452-1 attack are to be dosed with a Class-A amnestic. Description: SCP-2452 is, as of the time of writing, a collection of fifty-two printed photographs taken by deceased photography student Adrian Saul in 20██. 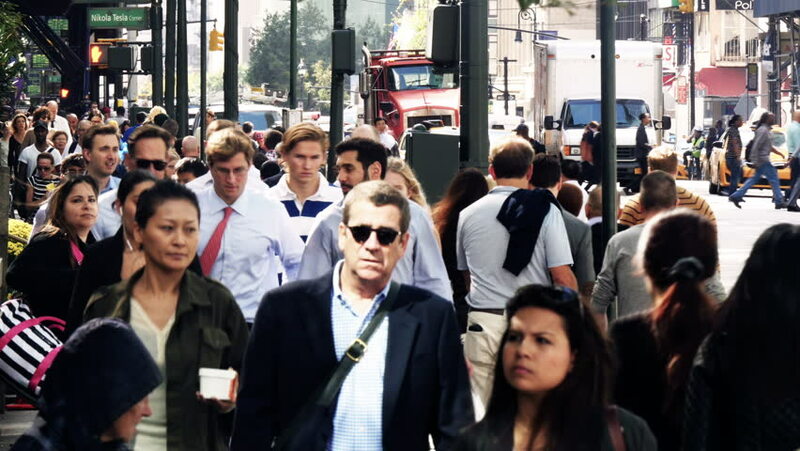 All but one instance of SCP-2452 portray crowded streets and analysis of the portrayed locations show that they were taken in Mr. Saul's local area of ███████. The only exception to this is a photographic self-portrait taken by Mr. Saul in his apartment. SCP-2452-1 is a headless humanoid figure wrapped in bandages which appears in every instance of SCP-2452. SCP-2452-1 generally appears in the foreground of shots, often reaching towards the camera in a threatening manner. However, SCP-2452-1 has been known to change its position in SCP-2452 instances when they are not under observation. SCP-2452-1 will only physically manifest outside of SCP-2452 when an instance of SCP-2452 is destroyed to a degree where the image is no longer visible. When this occurs, SCP-2452-1 will disappear from every instance of SCP-2452, as well as all copies, and physically manifest in the vicinity of an individual portrayed in the destroyed photograph. Note that although SCP-2452-1 is present in every instance of SCP-2452, only one entity appears during manifestation. Upon manifestation, SCP-2452-1 will attempt to eliminate every individual portrayed in the destroyed instance of SCP-2452. It typically accomplishes this through strangulation, but has been known to use blunt force when this usual method is not possible. If SCP-2452-1 is killed during a manifestation, its body will disappear and a new instance of SCP-2452-1 will appear at its location within five to ten minutes. Although SCP-2452-1 will appear in the vicinity of its first target, it will move on to other targets via normal ambulation, and as a result can be tracked down between killings. When SCP-2452-1 has eliminated all of its targets, its physical form will disappear and it will reappear in each instance of SCP-2452. The original destroyed instance of SCP-2452 will also repair itself, no matter what level of destruction it went through. The only known method of ending an SCP-2452-1 manifestation early is by capturing its image via photography.1 When this occurs, SCP-2452-1 will disappear in the same manner as it would after killing all its targets, and the photograph taken of it will become a new instance of SCP-2452. The original destroyed instance of SCP-2452 will still repair itself under such circumstances. SCP-2452 was discovered by police, along with Mr. Saul's strangled body, in his apartment after neighbors reported he had not been seen for several days. Analysis of the photographs and materials in Mr. Saul's apartment indicated anomalous activity had taken place, and the Foundation quickly took over the investigation and brought SCP-2452 into containment. 1. Video recordings of SCP-2452-1 do not appear to be effective, despite being made of countless frames of what are essentially photos.